My husband is a long time bike rider and purchased a Harley Rocker C this spring. All of a sudden, at age 58, I decided I wanted to learn to ride! I signed up for the Rider's Edge course at Thiel's Wheels in Upper Sandusky, Ohio. It was a wonderful experience! I learned SO much AND I made some great new friends. It was a physically grueling weekend for me, but I passed the test and received my motorcycle endorsement. Just prior to taking the course, my husband found a 2001 Honda Rebel with 600 miles on it. He got me started... and bless his heart, ran up and down our road beside me till I got the hang of it! I'm only 5'2" so the Rebel is a good fit for me, although I will always covet a Harley! Maybe someday! This summer I have been working on mastering the skills I learned, and I am very proud of my accomplishments! 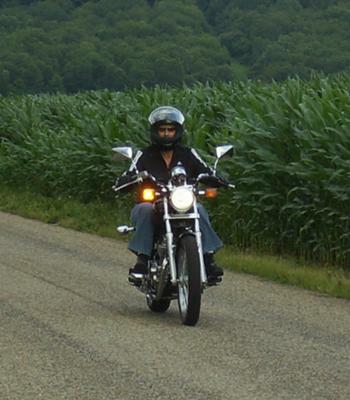 I truly believe everyone should take a Motorcycle Foundation Safety course! Congratulations to you!! I'm 57 and have been riding since March, started on a Rebel myself in parking lots. I rode my Rebel for 3 months and knew it was time for me to move up to a bigger bike. How I love being out on the open rode. Good luck to you and have a blast! You R as young as your bike!! I learned at age 49, still afraid to ride on gravel (spilled my bike a few times). Wish there more scary cats like me and could venture out carefully!! Congratulations. Never too old. I'm in my late 40's and just started riding earlier this year. I love it. Wish I had started riding many years ago. Better late than never. Be safe. I too started riding late in life and I am loving it. I took the course and then found a bike a few months later. After 4 years I now own 3 Harley's and love all of them from a sportster to fatboy to roadking and I'm only 5'2" also so don't let anyone tell you a bike is too big for you because if I can ride it so can you. You go girl! Love the Rebels. Not sure what size you bought. They are great bikes to learn on! We just visited Sandusky, OH for the first time. Went up to Cedar Point. I didn't realize OH was so beautiful. Happy Riding!